Martins Susters (white) scored for Phantoms at Bracknell. Peterborough Phantoms had to survive a late scare before extending their longest English Premier League winning streak last night (November 26). The city men emerged from Bracknell with a 5-4 success despite conceding four times in little more than six minutes late on. Scott Robson bagged his first goal of the season for Phantoms at Bracknell. It meant the final outcome was all too close for comfort and didn’t reflect the dominance of Slava Koulikov’s side, who had controlled the vast majority of a game which ended in a 20th successive victory over the struggling Bees. But Koulikov’s decision to rest star netminder Janis Auzins with his side holding a 5-1 lead almost backfired as replacement Adam Long was beaten by three of the four shots he faced. “The game was done and dusted,” said Koulikov. “We put in a really controlled performance and that was reflected by the scoreline after 50 minutes. “But then a couple of bounces went against us and they have Bracknell a big lift. Phantoms netminder Adam Long was given some game time at Bracknell. “I always felt we were in control of the game even though it is only natural to have a few bad thoughts in your head when seeing a lead be reduced so quickly. Phantoms’ defenceman Scott Robson made the only breakthrough of the opening period with his first goal of the season. The visitors took command in the middle session with three further goals as Darius Pliskauskas’ powerplay effort was followed by strikes from Owen Griffiths and Martins Susters. And when Ales Padelek made the most of another numerical advantage with little more than 10 minutes remaining, a smooth success appeared to be in the bag. But Bracknell clearly hadn’t read the script as they dramatically clawed their way back into contention. 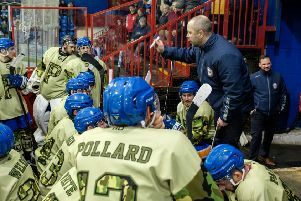 Carl Thompson opened the hosts’ account on a powerplay to end Auzins’ hopes of a shut-out and the Latvian netminder was soon given the remainder of the night off. Long was beaten by Bees’ player-coach Lukas Smital just 26 seconds after stepping into the crease and then conceded twice in the space of 52 seconds to Rio Grinell-Parke and Smital again. Phantoms suddenly found themselves holding on to the narrowest of advantages, so were mightily relieved when Bracknell man Scott Spearing collected a roughing penalty seconds later. But Will Weldon was then called for a high-stick with 61 seconds to go and that gave Bees the opportunity to pull netminder Alex Mettam. However, Phantoms stood strong to extend a winning run against Bracknell which stretches back more than three years. And they’re out to complete a four-point weekend when entertaining bottom side Manchester tonight (November 27, 5.30pm).